New Year. New Goals. Now that the school year is well on its way, we all have new things that we want to try for our classroom this New Year. If you have not incorporated Depth of Knowledge questions/prompts, then now is a great time to start! I can help you (more on that in a bit). 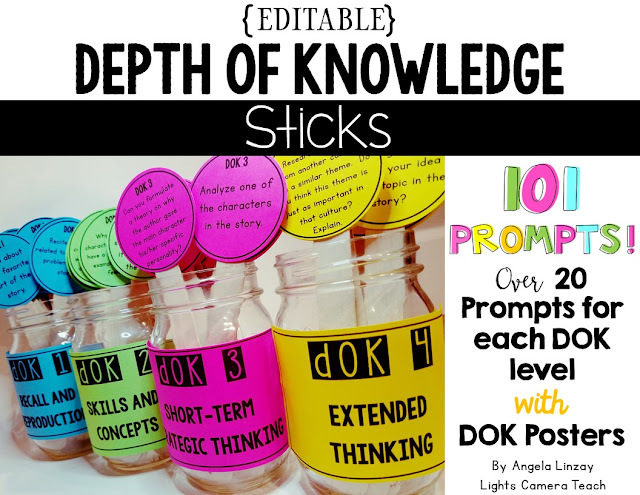 Did you know practicing Depth of Knowledge (DOK) questions/prompts can help improve critical thinking skills? If you're unfamiliar with DOKs, I would highly encourage you to Google it. I'm not going to go in depth with it's meanings but here they are in a nutshell. There are 4 DOK levels. Each level reflects a different level of cognitive expectation, or depth of knowledge, required to complete the task. 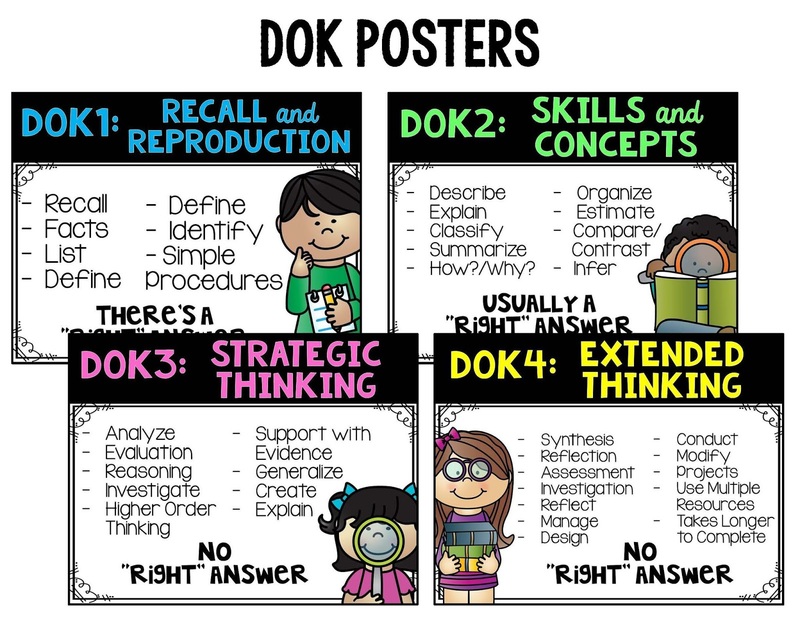 DOK tasks are great to work through with your students. I have found with my own kids that doing a think aloud of my thought process allows them to see the cognitive pathways that I'm taking. 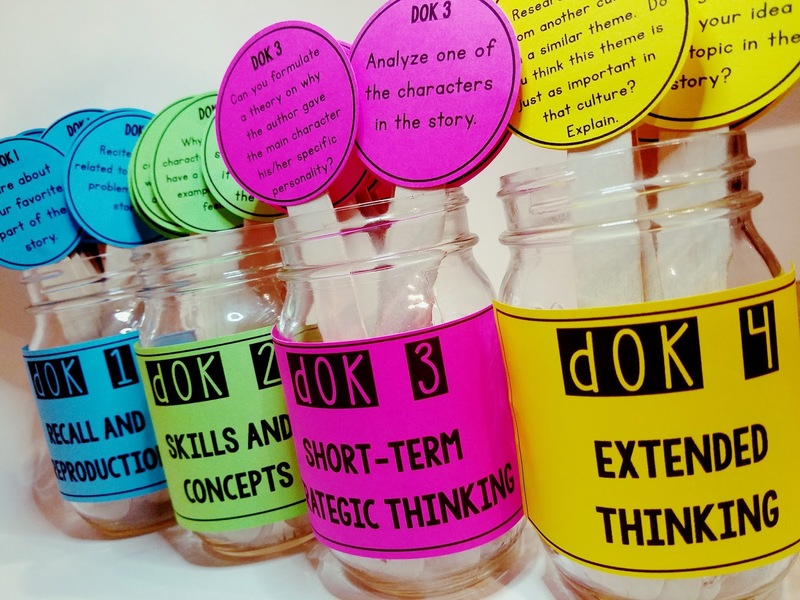 Some teachers don't know where to begin or don't even have the time to pull resources and DOK questions/prompts/tasks together. Don't worry. Remember? I got your back. I created a DOK kit just for YOU. If you're anything like me, time is PRECIOUS! So is money, cause it ain't growing on trees. Because of that, I created this resource to be an ink saver. It's in black and white. Just choose the color paper/cardstock you want and print onto that! 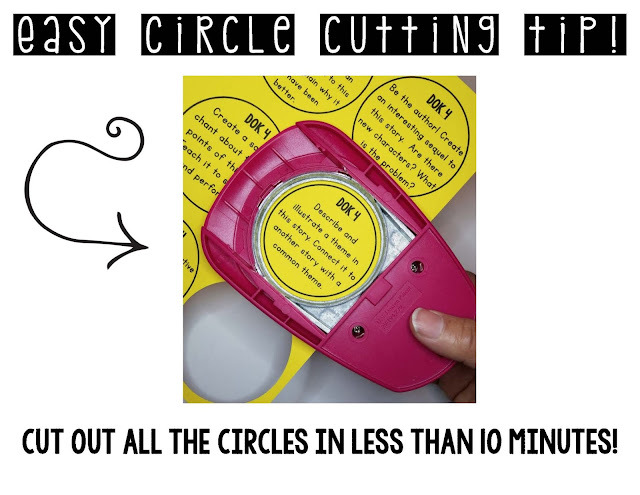 I don't have time to be cutting out 101 circles (plus, I'm a horrible cutter), so the BEST and FASTEST way to do this is with a circle cutter. 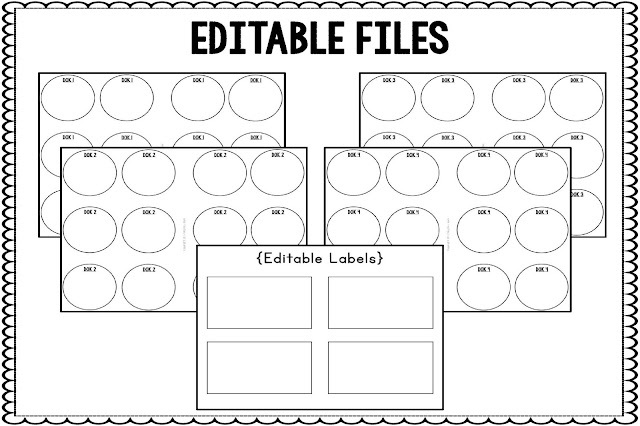 I created this with BUSY teachers in mind, so the circles are spaced around the edges perfectly so that you can just punch them out easily. I flip the cutter upside down so that I can see what I'm cutting out. This is a 2.5" circle cutter and can be purchased at any craft store or click on my Amazon affiliate link below. I glued the circle to craft sticks, put the DOK labels on mason jars, and then put them in a tin utensil carrying case that I found at some random store. I love it because it has a handle on it. 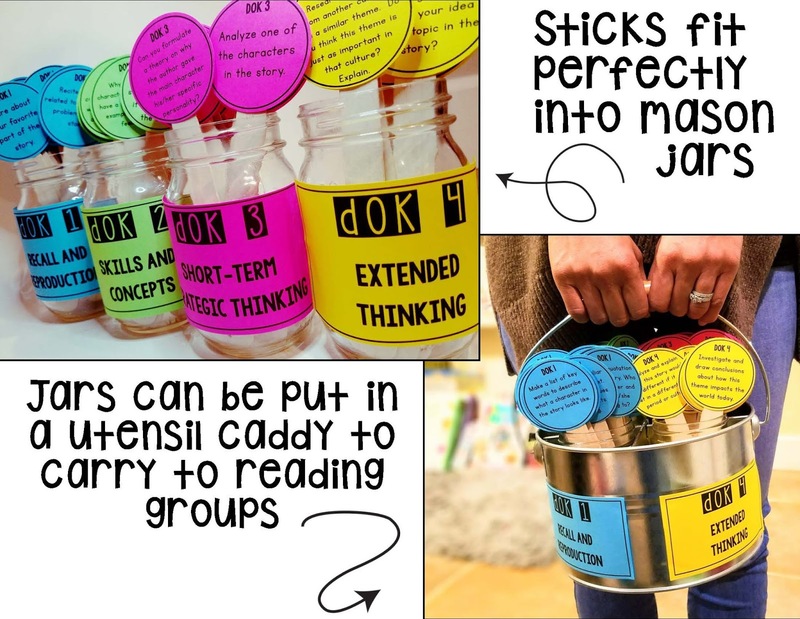 You can carry it around to your reading table for small groups, then to the front of the room for class discussions, or even to a literacy center. I just LOVE that it's easy to transport because I don't always stay in one area! 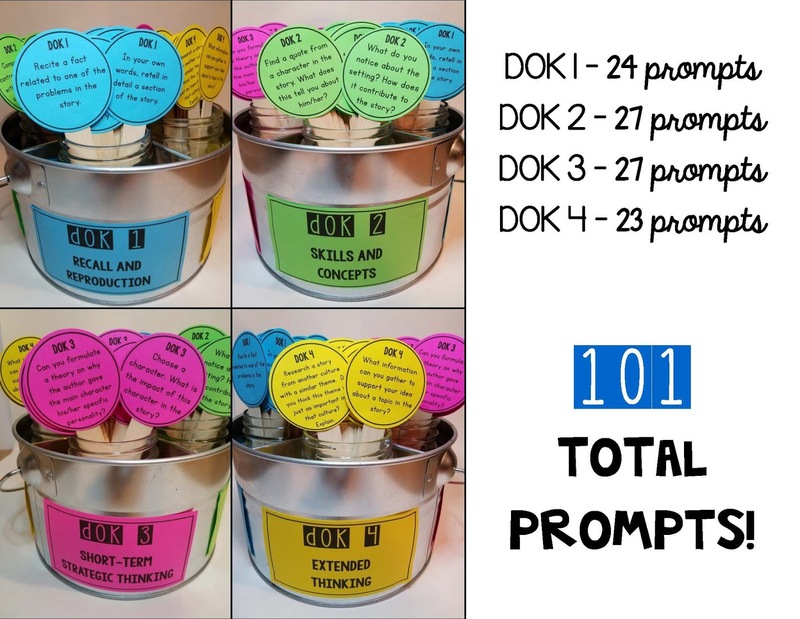 So if you haven't really gotten started on DOKs or want to get better at them, I think this resource could really help you out. I can't find the exact utensil carrier, but here is one that will work well. It even has extra space for some teacher supplies. The comments say that mason jars do fit in the compartments. Thanks for reading friends! Have a great day!